I didn’t realize until I finished The Yacoubian Building how its characters and stories had caught me up emotionally. The consistently flat narration–I’m not sure if this is a function of the translation or a genuine reflection of Al Aswany’s style–and the dispersal of our attention across multiple plots conspired against any strong feelings except curiosity for much of the novel. But by the end I found that curiosity had turned into concern, even care, about how each person’s story would end, and each ending was, in its own way, deeply moving. Some stories (Souad, Taha, Hatim especially) are heartrending; others (Abaskharon and Malak) wryly comic; others (Busayna and Zaki) are surprisingly beautiful and hopeful. 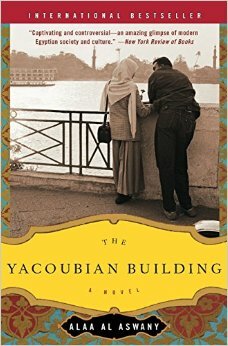 The Yacoubian Building (and the Yacoubian Building) is a microcosm of a world that comes across as chaotic, risky, bleak, yet shot through with a kind of wistful longing for dignity and love, the two things all of the characters are ultimately in search of. Even as you watch their mistakes, their compromises, their sacrifices, their sins, it’s hard to sit in judgment, because the medium they move in is so relentlessly corrupt. The conviction that there’s no winning against this system may account for the matter-of-fact tone and the absence of authorial commentary about even the novel’s most depressing sequences, such as Taha’s descent into extremism–inaugurated not by religious fanaticism or political commitment but by the injustice and prejudice of a bureaucracy that blocks him from his honorable dream–or the disastrous conclusion of Hatim’s affair with Abd Rabbuh, for whose shame, guilt and resentment Hatim’s sad love proves an unequal match. “I’m sure that Our Lord will forgive us because we don’t do anyone any harm,” Hatim reassures his lover; “We just love one another.” If only that belief were reflected in the world around them. The Yacoubian Building is this month’s reading for The Slaves of Golconda: check out the group’s website for other posts, and feel free to join in the discussion on the Forum.